Schools’ work in mathematics has shown little improvement over the last three years. Percentage of pupils hitting expected thresholds in their respective key stages. now… a 14.2% improvement over the last three years (A* to C) seems like a pretty big deal to me… granted other Key stages are not as impressive but still. harsh! recognition a bit further down! Although the largest increases have been in the proportion of pupils gaining A* to C grades, the average performance and the proportion gaining A*/A grades have risen too. I suppose it should be noted that this is 2011… its a bit out of date! All bets are off regarding the new exams I’m afraid! While this overall improvement in pupils’ progress is welcomed, two issues have emerged. First, the decline in the proportion of pupils reaching Level 3 by the end of Key Stage 1 reflects underachievement of the most able but this is masked by the expected two levels of progress measure in Key Stage 2. If, for instance, an able Year 2 pupil was not sufficiently challenged and reached Level 2a instead of Level 3, her/his progress to Level 4 by Year 6 would be considered to be in line with expected progress, whereas in reality Level 4 would represent underachievement for that pupil. Crucially, expectations of the same pupil five years later would be grade C GCSE, yet that pupil perhaps should have been on track to reach Level 5 at Key Stage 2, then an A*/A grade at GCSE, leaving her/him appropriately equipped to pursue the subject at A level or beyond. This is some serious blue sky thinking right here guys and completely ignores the opposite scenario where a pupil massively achieves and barely scrapes a level 2c, this poor kid who might just have had a great and very lucky day (it happens) now has an unrealistic target and would be seen as ‘failing’ by certain establishments for not living up to his inflated potential. The reality is that both of these statements are at the very extreme of what actually happens and so for Ofsted to include this I feel is somewhat dangerous in terms of viability and liability. …a third of FSM pupils enter secondary education below the expected level and their chances of progression to grade C or better at GCSE are slim. It’s an issue for the pupils who are sadly being let down and it’s an issue for the schools who receive extra funding and will need to justify the spending. The school I am at has spent a lot of time cleaning house so to speak on the pupil premium issue to the point where there are ‘pupil premium’ champions in most departments (myself being one!) where part of our role is to make sure the department has a strong focus on the pupil premium cohort. We’re doing this by making sure we have a percentage of PP books during book looks, a percentage of PP in the various intervention strategies. There’s more but I’ll save that for a separate blog post. some stuff on travellers not attaining. problems with SEN and attainment… you know…all the usuals. The issue is not the differentiation, it’s the assessment. I know that I don’t want to push a pupil faster than they can go as I want to nip any misconceptions in the bud as they appear. At the same time I do want to push them as hard as I can. As we are often held accountable for the pupils progress is it not possible (and I’m playing devils advocate here), is it not possible that without thinking we hold all pupils back until everyone is ready to be moved on. With better in class assessment at a very regular basis (both formal and informal of course) we would have the evidence and the peace of mind to push pupils in all sorts of different directions. Of course on the flip side it could also be that we (the proverbial teacher we) do not like letting go of our power/control and as such do not let pupils explore more by themselves? regardless let’s move on or i’ll never get the thing read! Nearly all the secondary schools had set themselves targets for increased proportions of pupils to pass five or more GCSEs at grade A* to C, including English and mathematics. Consequently, they were keen for more pupils to attain grade C or better in mathematics … … These tactics account for the rise in attainment at GCSE; this is not matched by better teaching, learning and progress in lessons, or by pupils’ deeper understanding of mathematics. Sorry, no dice! 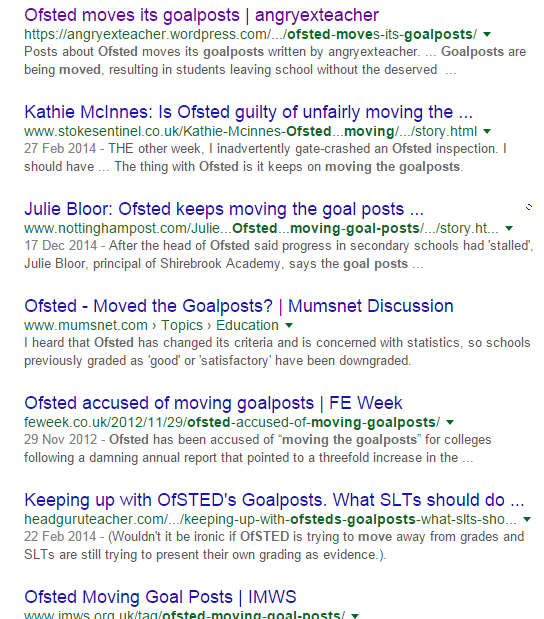 Product of the accountability system Ofsted helps to enforce. The cost to the lives of the pupils, teachers, schools and local communities of not working like a dog to these artificial standards is lower than sacrificing other elements of the curriculum in which many students find success in . ok… last topic for today! It remains a concern that secondary pupils seemed so readily to accept the view that learning mathematics is important but dull. A popular viewpoint in the wider world as well. We as maths teacher love our subject, see the beauty in it and share that daily. Unfortunately it feels sometimes that we are urinating into the wind when it comes to this area. I’m not going to delve too much into this here as it’s a whole hornets nest and I’ve still got 80 or so pages to go! instead I’ll drop this link here that sums up a lot of my thoughts on the topic. Thanks for reading… i’ll be back with more later!